National RF’s Type HFDF high frequency location system is a proven noise hunting and location directional antenna system that allows you, in many cases, to walk right up to the source of High Frequency (HF) noise! Used by several power companies around the United States, professional noise hunters, and other communications specialists, the HFDF has located noise sources that emanated from pole power transformers, arcing electric fences, CATV in-line amplifiers, plasma TV screens, and even Marijuana grower’s heating lamps! The system incorporates several plug-in, tunable magnetic loop sensors of a proprietary National RF design, that cover the frequency range between 1.8 MHz and 55 MHz. The unit is packaged in a hand-held, lightweight metallic enclosure, with a pistol grip and a magnetic compass mounted on top. The compass is used to get magnetic bearings to the noise source, which may be plotted on a map to triangulate, and ultimately pin-point, the location of the noise source. In certain cases, our customers tell us that they have been able to walk right up to the interfering noise source and correct the situation on the spot! 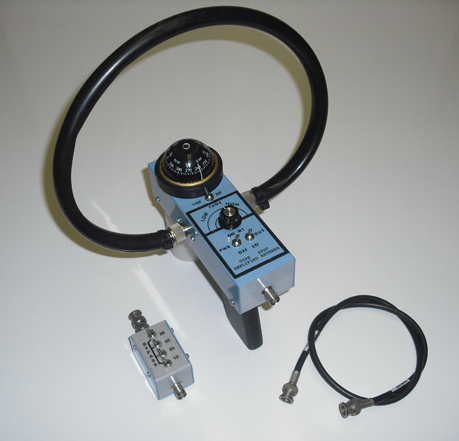 The Type HFDF Noise Location Package includes the HFDF Noise Gun, five unique loop EM sensors that cover the frequency range of 1.8 to 55 MHz, the AT-65N in-line attenuator, and a three foot interfacing cable with BNC connectors on either end. The customer is responsible for providing a portable HF receiver, such as the Sony ICF-SW7600GR, or the numerous Sangean portable Short-wave receivers that feature external antenna connections, which the noise gun interfaces to. Although not absolutely necessary, we strongly recommend that this portable HF receiver have a signal strength indicator (S-meter or signal strength bar-graph display). This will facilitate in determining when a null is achieved, and hence the unit is pointed in the line-of-sight of the incoming signal. Although the HFDF unit includes a “Hi – Lo” gain switch, that drops the output level to the receiver by approximately 12 dB, additional attenuation of very strong transmitter signals may be necessary. This is accomplished by the AT-65N step attenuator, which can switch in up to 65 dB of attenuation in various combinations of 35, 20, and 10 dB attenuation steps. The AT-65N is designed to attach directly to the output side of the HFDF gun assembly, thus making the two units one integral system. With this affordable combination, you should be able to locate any noise source (or legitimate HF signal) in the prescribed frequency range. To keep the customer’s cost to a minimum, the loops are available individually, should you know in what frequency range your noise is in, or as a package of five, covering the indicated frequency ranges. The AT-65N is also available separately as well. For additional technical information on the HFDF hardware please review the specifications listed on this website page for the “Type HFDF Vector-Gun.” The terminology “Vector Gun” and the “Noise Gun” are used interchangeably for the same hand-held hardware. However, the Noise Location Package includes the attenuator and the interface cable, not provided with the Vector-Gun product. Should you have further questions on this package, please call us at the listed contact numbers.